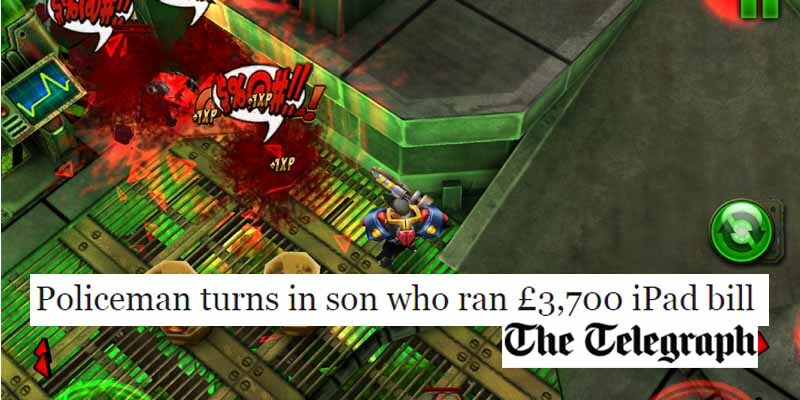 Unlike the previous case, Bristol, UK police officer Doug Crosson did not hesitate to contact authorities after his 13-year-old son Cameron racked up a $4500 bill on the Apple Store from games including Nova 3, Gun Bros 2, Gun Builder, Infinity Blade, and Plants vs. Zombies. That was the only way to get the money refunded, so he got in touch with the UK government’s National Fraud Authority, who in turn reported the teen’s spending to the police. From there, the police would have to decide whether or not it was an actual crime, if they wanted to question the teen, and if the whole thing would be pursued. “I am the father of a studious, polite and sensible 13-year-old who has been duped after uploading free children’s games on his iPod and iPad. None of us had any knowledge of what was happening as there was no indication in the game that he was being charged,” said Crosson.